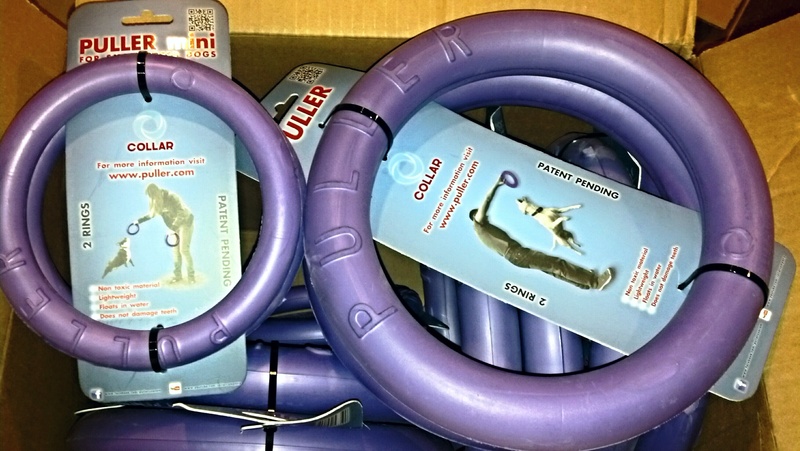 Puller interactive toy for dogs is a brand new patent pending product that has just been released. The Puller comes as a set of two purple rings. It was developed by trainers and is designed to interact with and exercise the dog. It is made out of a durable lightweight material which allows the dog to bite into with ease and comfort. The Puller is the perfect interactive toy, the dog can chase it, jump for it, tug with it, and retrieve it from the water. Puller submerges only 20% in water making it easy for the dog to see. The large Puller is designed for medium and large breeds, and the Puller Mini is for small breeds. It can be used in small or large areas, either way you can exercise and tire the dog fast. Diameter of Large Puller is 11"
* Special non toxic compound allows owner to work with the dog for long periods of time. * Ability to float in water opens up additional opportunities in exercising and interacting with the dog. * It is odorless, which is very important when interacting with dogs. Also, PULLER does not leave any odor on hands of the handler. * It does not injure dog’s teeth and gums. When being bitten, PULLER gently lets dog’s teeth to sink deep inside the material, without loosing its shape or properties for long periods of time. That’s why PULLER’s material is unique. All dogs like this effect. After trying it once, all dogs simply “fall in love” with it. REMEMBER THIS IS AN EXERCISE TOY FOR INTERACTIVE USE NOT A CHEW TOY! !